A Cookbook: More than 175 Recipes for Fresh Beans, Dried Beans, Cool Beans, Hot Beans, Savory Beans, Even Sweet Beans! Workman Publishing Company, 9780761132417, 400pp. Has there ever been a more generous ingredient than the bean? 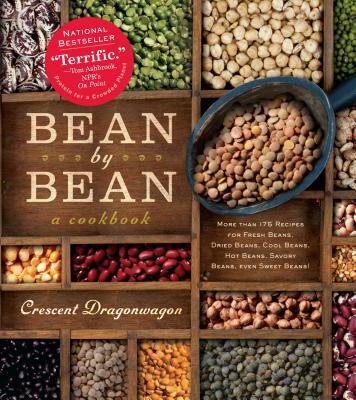 Down-home, yet haute, soul-satisfyingly hearty, valued, versatile deeply delectable, healthful, and inexpensive to boot, there’s nothing a bean can’t do—and nothing that Crescent Dragonwagon can’t do with beans. From old friends like chickpeas and pintos to rediscovered heirloom beans like rattlesnake beans and teparies, from green beans and fresh shell beans to peanuts, lentils, and peas, Bean by Bean is the definitive cookbook on beans. It’s a 175-plus recipe cornucopia overflowing with information, kitchen wisdom, lore, anecdotes, and a zest for good food and good times. Consider the lentil, to take one example. Discover it first in a delicious slather, Lentil Tapenade. Then in half a dozen soups, including Sahadi’s Lebanese Lentil Soup with Spinach, Kerala-Style Dahl, and Crescent’s Very, Very Best Lentil, Mushroom & Barley Soup. It then turns up in Marinated Lentils De Puy with Greens, Baked Beets, Oranges & Walnuts. Plus there’s Jamaica Jerk-Style Lentil-Vegetable Patties, Ethiopian Lentil Stew, and Lentil-Celeriac Skillet Sauce. Do the same for black beans—from Tex-Mex Frijoles Dip to Feijoada Vegetariana to Maya’s Magic Black Beans with Eggplant & Royal Rice. Or shell beans—Newly Minted Puree of Fresh Favas, Baked Limas with Rosy Sour Cream, Edamame in a Pod. And on and on—from starters and soups to dozens of entrees. Even desserts: Peanut Butter Cup Brownies and Red Bean Ice Cream. Crescent Dragonwagon is the James Beard Award–winning author of seven cookbooks, including Dairy Hollow House Soup & Bread Cookbook, Passionate Vegetarian, and, most recently, The Cornbread Gospels. She is also a contributing editor to Relish magazine and has appeared on Good Morning America, Today and NPR’s The Splendid Table. She lives, grows, and cooks her beans on a farm in Putney, Vermont.